This entry was posted in Economics, Environment and tagged batteries, climate change, coal, environment, global warming, photovoltai, renewable energy, solar, techno-optimism, wind. Bookmark the permalink. ← Who should the SEC punish next for the Madoff scandal? Itself. The numbers quoted appear to be for the US energy markets. When you look at the EIA projections for world markets the real sleeping giant is nuclear power, particularly in China, India, Asia and the Middle East. Nearly all the EIA projections hinge dramatically on the future price of oil and use only proven reserves in oil price projections. The US energy mix is perfect for renewable use. When the sun does not shine and the wind does not blow plenty of natural gas to pick up the slack. Good discussion here, with some new (to me) facts and logic. However, a few huge considerations are missing or under-emphasized. Fear of anthropogenic climate damage is totally fraudulent. Competitiveness is distorted by subsidy, and even the subsidies are distorted by “crony capitalism”. ALL energy economics are determined by site and application specifics. Classic warnings come to mind: “Figures don’t lie, but liars do figure” and “All generalizations are false, including this one”. When you dig deep into the 2013 EIA projections that point is clearly illustrated. The number 97% appears to be pulled out of someone’s a@3e! 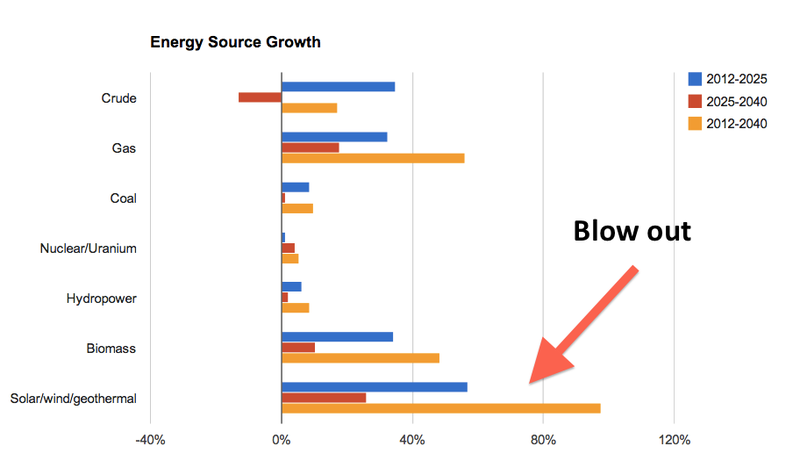 Wind has been growing 30% year-to-year, for the last 5 years, essentially doubling every 3 years. Seems unlikely that all of a sudden the next doubling will happen in 30 years. Do they predict a major calamity, or something? And yes, wind is majority of the new installed capacity, so renewals currently go with the wind.